Wife: Married on 27 December 1915 to Erika Freiin von der Goltz (born 8 April 1893 in Stargard/Pommern) – one son (born 20 October 1921) and two daughters (born 4 October 1916 and 26 June 1923). SS-Standartenführer: 1 October 1935 (entered the SS at this rank). 2 March 1901: Entered the Army as a Fähnrich in the 2. Hannoversches Dragoner-Regiment Nr.16. 1 October 1906: Detached to the Military Riding Institute. 1 October 1908-21 July 1911: Detached to the War Academy. 16 June 1911-21 July 1911: At the same time, detached to the Fußartillerie-Regiment von Hindersin (1. Pommersches) Nr.2. 1 April 1912: Detached to the Great General Staff. 22 March 1914: Transferred to the Great General Staff. 2 August 1914: General Staff Officer in the 9th Cavalry Division. 9 September 1916: Transferred to the General Staff of the 75th Reserve Division. October 1916: Transferred to the General Staff of the 6th Cavalry Division. November 1916: Transferred to the General Staff of the 7th Cavalry Division. 18 April 1917: Officer of the Army and detached to the General Staff of the Royal and Imperial Austro-Hungarian XII Army Corps. November 1917: General Staff Officer in the Senior Quarter Master of Army High Command 10. 28 March 1918: Transferred to the General Staff of the 234th Infantry Division. April 1918: Transferred to the General Staff of the XXVI Reserve Corps. 1 May 1919: Transferred to the General Staff of the Reichswehr-Brigade 20. 13 December 1919: Transferred to the Reich Defence Ministry. 1 April 1922: Squadron Chief in the 2nd (Prussian) Reiter [Mounted]-Regiment. 16 October 1922-11 November 1922: Detached to the Artillery Course. 1 October 1923: Transferred to the staff of the 6th Division. 1 February 1927: Commander of the 6th (Prussian) Reiter-Regiment. 19 September 1929-18 October 1929: Detached to the Firing Course for Heavy Infantry Weapons. 1 January 1931: Commandant of Insterburg. 30 November 1932: Retired from the Army. 1 October 1935: Joined the SS with the rank of SS-Standartenführer. 1 October 1935: On the staff of SS-Oberabschnitt [Main District] “North” (Training Consultant North). 15 April 1936: On the staff of SS-Oberabschnitt “Northwest” (Training Consultant Northwest). 15 May 1936: On the staff of SS-Oberabschnitt “North Sea” (Training Consultant North Sea). 1 July 1938: Placed at the disposal of the Army for employment. 26 August 1939: Commandant of Army Rear Area 580. 20 May 1941: Army High Command Leader Reserve. 24 June 1941: Armed Forces Commander of Ostland. [With headquarters in Riga, Braemer’s area of responsibility comprised the Baltic States (Latvia, Lithuania, and Estonia), known collectively as “Ostland,” and White Russia.]. 20 April 1944: Army High Command Leader Reserve. 17 January 1945: General for Special Employment in Wehrkreis [Military District] Command I, Königsberg. 22 January 1945: General for Special Employment in Wehrkreis Command II, Stettin. 10 February 1945: Commandant of the Army Rear Area of the 11th Army. 4 March 1945: Army High Command Leader Reserve. 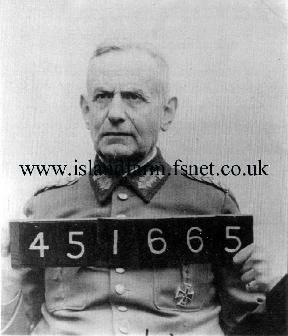 3 May 1945-October 1947: Prisoner of war in British captivity. 9 January 1946: Transferred to Island Farm Special Camp 11 from Camp 1. 6 October 1947: Transferred via Camp 43 to Camp 6 CIC Neuengamme (Civil Internment Camp). Prussian Royal Hohenzollern House Order, Knight’s Cross with Swords: 17 January 1917. Braemer was highly decorated during World War I. Note he held both the Royal Hohenzollern House Order and the Princely Hohenzollern Honor Cross. Despite the close similarity in names, these were two separate yet affiliated orders. The first one was the personal house order of Kaiser Wilhelm II, the King of Prussia and Emperor of Germany, while the second one was the personal house order of the Kaiser’s Catholic cousins in Sigmaringen. Both decorations were virtually identical in appearance except for different centrepieces and mottos, VOM FELS ZUM MEER (“From the Mountains to the Sea”) and FÜR TREUE UND VERDIENST (“For Fidelity and Merit”) respectively.